These developments are to be understood in the context of societal change extending over several centuries providing the human being with a rising degree of self-determinedness of his/her personal and community identities. De-verticalisation of societies provided for the replacement of command and obedience relations (e.g. feudal governance, patriarchy) by societal patterns of equality and interaction. As we assess the agenda and the results of the Copenhagen Conference on Climate Change we are aware that the realisation of the principle of sustainability at local national and global levels is to be recognized as one of the central objectives of the agenda for the 21st century. The consequences of trans- sectoral, trans-national and the trans-generational transfers of externalities of the unsustainable exploitation of natural and environmental resources such as in international river basins or international marine and coastal ecosystems are becoming ever clearer. Climate change has to be understood as not only requiring societal development in both mitigation and adaptation strategies but, as articulated in the working paper of the EU High Representative of 3 March 2008 on „Climate Change and International Security“, has also very clear societal implications – such as the growing number of environmental refugees which are presented in this report as a threat to European security. What then is the “other” and what is “one-self”. Are not all human beings who develop their lives with a certain degree of self-determination “different”, the “other”? Why are many societies still sticking to the categories of the nation- state considering the ethnic, religious, linguistic or cultural “other” as a threat, a threat to their identity, to their human security and their survival? Traditional socialisation into the concept of otherness related it to the enemy on the other side of the national border. In that sense, xenophobia also served as an important mechanism in the affirmation of authority providing the justification for structures of command and submissiveness through hatred, rejection and violent conflicts. Six months after the terrorist attack in Madrid in March 2004 the Prime Minister of Spain Rodriguez Zapatero presented to the United Nations General Assembly a call for an “Alliance of Civilizations”. The intention of this initiative was to increase and further develop world awareness to the risks that a wall of misunderstandings between the West and the Arab/Islamic world may cause. Zapatero invited the Prime Minister of Turkey Recep Tayyip Erdogan to jointly sponsor this initiative in the United Nations. The UN Secretary-General launched then formally the “Alliance of Civilizations” on 14 July 2005. Also this initiative forsaw the appointment of a High-level Group of personalities which presented a report the following year. The report recommends the development of partnerships in the framework of the Alliance of Civilizations with international organizations that share its goals. The report refers in this context especially to the European Union, the OSCE, UNESCO, the OIC, the League of Arab States, ISESCO, UCLG, UNWTO as well as other international and national organizations, public and private. A pertinent example of societal development through human rights learning are the human rights cities. A joint report of UN-HABITAT and PDHRE was presented to the World Urban Forum in Nanjing, China, in November 2008. The report presents examples of how human rights related socialization processes, learning and education programmes can be taken as a tool for re-integrating societies fragmented by civil war, genocide or military dictatorships. There are now 25 human rights cities in Africa, Latin America, North America and Europe. Washington DC also became human rights city on 10 December 2008. 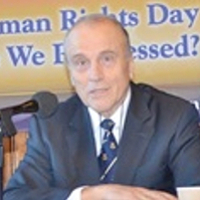 Dr. Lichem has been President and currently is Vice-Chairman of the Board of Interpress Service, Rome, a news agency specialized in global and development news and is member of the Board of PDHRE, People’s Movement for Human Rights Learning, New York. He also served as Special Adviser to the European Centre for Social Welfare Policy and Research as well as to the World Security Forum. Since 2001 he has been Chairman of the Advisory Board of the European Training Centre for Human Rights and Democracy in Graz, Europe’s first Human Rights City. After joining the Austrian Foreign Service in 1974 he served as Consul General in Ljubljana, SR Slovenija (1976-1980), and as Ambassador to Chile (1980-1984). From 1993 to 2000 he served as Austria’s Ambassador to Canada. At the Vienna World Conference on Human Rights in 1993 he served as Rapporteur on Human Rights, Democracy and Development. As an Austrian Diplomat he had responsibility for peacekeeping, UN reform and was entrusted by the United Nations with the reform of the UN Committee for the peaceful uses of outer space.